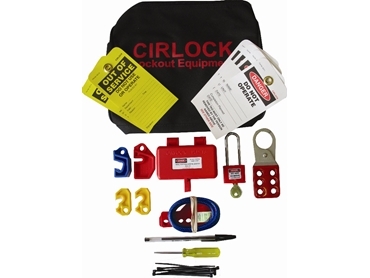 Cirlock 's popular Contractors Lockout Kits, CLK-1, now includes a free 240 plug lockout device. These lockout kits enable electrical technicians and others to safely lock out energy sources before working on them. lockout danger and warning tags. These lockout devices are packed in a convenient carry bag with zipper and belt hasp for easy storage and transport. Other personal lockout kits, as well as custom made kits are also available. CLK lockout kits are made in Australia by Cirlock, and are available through local electrical and other wholesalers.